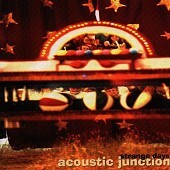 After a name change, changing their name back to Acoustic Junction, and being dropped by Capricorn Records, Acoustic Junction has been through a lot prior to their latest release, Strange Days. Aptly titled, the album, despite the frustrations and pressures that could have sent the band to their grave, finds them stronger than ever and looking back on their "Strange Days" and learning from their experiences. "Every Heart" gets you moving with its dance groove, folk tenderness, and pop hooks. "Melt," the album's first single, wins over your heart and your mind with its slow, silky essence lead by the wounded, but won't-give-in vocal style of frontman Reed Foehl and the light, sprinkling piano and percussion. "Goodbye World" gets you moving again with rich grooves from the rhythm section, sunny organ, and a relentless danceable beat. And then there is "Oh Me Oh My," another cut that displays the band's ability to get you dancing and grooving to their infectious sound while also staying tender and soft enough to allow you to just sit back and feel what they've been through the past few years while using a universal spin on the songs to help you relate to them as well. "Dancin' For You" deserves mention, too. Backing vocals by Graham Nash help give this sensitive acoustic piece, written for Foehl's song, a sweet sound, while Foehl's caring voice and the light acoustic guitar help propel the song right to your heart and your memory, where the song will stay for quite some time. It's a rare band that can go from cuts like "Dancin' For You," which has you in near tears as you sit down and feel the vibrant emotions running through the song, to a cut like "Goodbye World," a song that is all about dancing and having fun, but has its serious side as well. The band is back and in full force, that is for sure, and Strange Days is proof of that. I'll give it an A-.